Sep 17, 2014 - although there was no logical contact, no reflexes in upper limbs, weak ... Full list of author information is available at the end of the article. 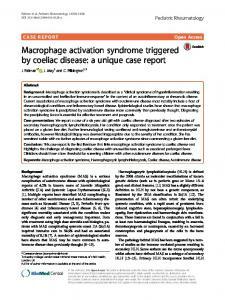 highlights the challenge of diagnosing coeliac disease with unusual features ... Haemophagocytic lymphohistiocytosis, Coeliac disease, Autoimmune disease. Jun 3, 2009 - Anaemia and thrombocytopenia are rarely the first manifestations of this ... The patient had macrocytic anemia and thrombocytopenia. Jul 24, 2008 - 123. CASE REPORT. A case of catastrophic antiphospholipid syndrome presenting with acute respiratory distress syndrome as the initial. Abstract. Background: We present a case of unsuspected Paget-Schroetter syndrome (also called effort thrombosis), one of .... sis, an early thoracic outlet decompression via a trans- ... The BMJ Best Practice treatment guideline for thoracic. prevalence of situs inversus and bronchiectasis . 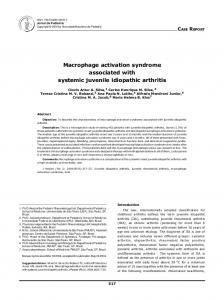 In the 1970s, Bjorn ... on a combination of clinical evaluation and electron microscopy examination of de-. factor, antinuclear antibodies - negative, normal range of ferritine. 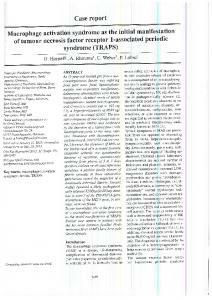 High dose methylprednisolone therapy – not effective. Deterioration due to bronchopulmonary infection. Chest radiography and tomography revealed bronchiolitis, bronhoobstructive syndrome and respiratory insufficiency. Immunosuppressive therapy combined with antibiotic therapy, after which autoimmune hepatitis (ALT - 4898 IU/l, AST -3100 IU/l, ferritin – 3600 mkg/l , LDH -1200 IU /l, Bil total - 116 mmol/l .However,clinicall situation became much better: normal body temperature, relief of rashes and respiratory failure. Leicocytosis decreased to 17x103. 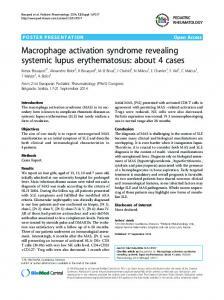 Macrophage activation syndrome was possible, but there was no decrease of platelets. Therapy included 2 mg/kg of prednisolone orally, detoxication, hepatoprotectors therapy, correction of hemostasis. Within 3 weeks there was a slow decline in level of transaminases, ferritin, total bilirubin what gave opportunity to reduce doze to 1,3 mg/day. Conclusion Analyze of the disease symptoms showed that the autoimmune hepatitis had been developed because of the macrophage activation syndrome after using the antibacterial drug. Probably, such pathology reaction of the immune system is genetically determined. It was unexpectedly, that oral usage of prednisolone would show better efficiency in compare with pulse therapy. 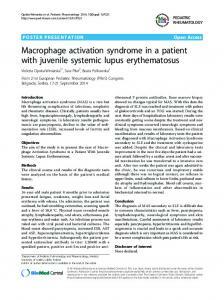 Our case illustrates the difficulty of MAS diagnostics in children with JIA and can be the result of immune system hyperactivity caused by unknown reasons. 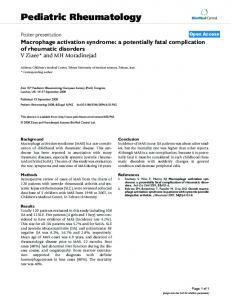 Mechanisms of MAS syndrome require to be studied in detail and included in early diagnostic criteria. Disclosure of interest None declared. Rheumatology, Scientific center of pediatrics and children surgery, Almaty, Kazakhstan © 2014 Akhenbekova et al; licensee BioMed Central Ltd. 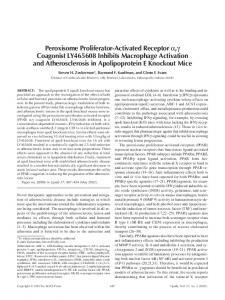 This is an Open Access article distributed under the terms of the Creative Commons Attribution License (http://creativecommons.org/licenses/by/4.0), which permits unrestricted use, distribution, and reproduction in any medium, provided the original work is properly cited. 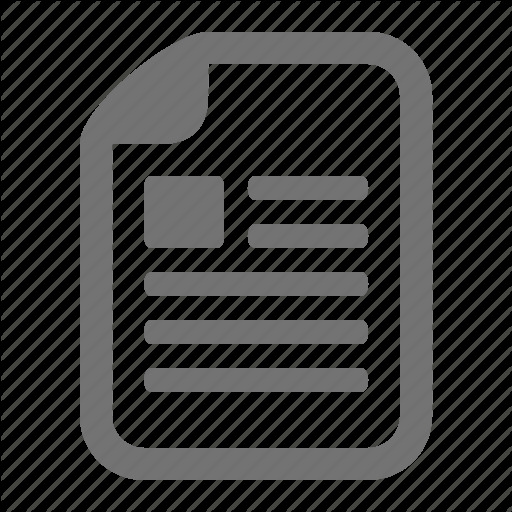 The Creative Commons Public Domain Dedication waiver (http://creativecommons.org/publicdomain/zero/1.0/) applies to the data made available in this article, unless otherwise stated. doi:10.1186/1546-0096-12-S1-P230 Cite this article as: Akhenbekova et al. 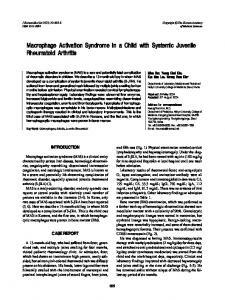 : A case of macrophage activation syndrome in a child with systemic juvenile idiopathic arthritis. 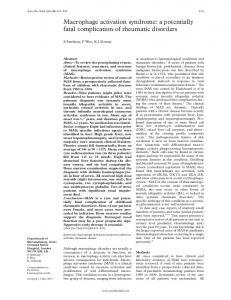 Pediatric Rheumatology 2014 12(Suppl 1):P230. 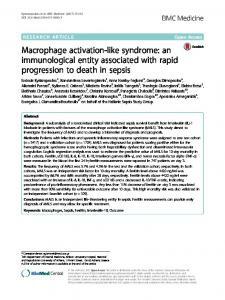 Report "A case of macrophage activation syndrome in a child ... - Springer Link"